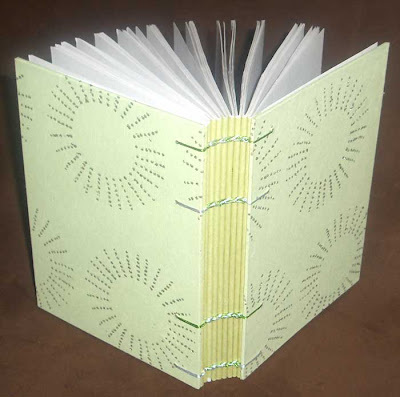 This swap book was submitted by Rhonda, of MyHandboundBooks. It is a hardcover chain stitch binding. There is pale green paper with silver star bursts on the covers. 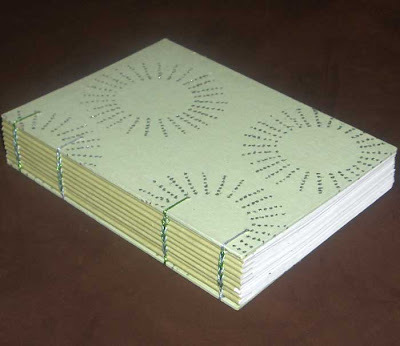 The spine edge of each section is also covered with pale green paper then sewn using two colours of metallic thread, green and silver, to match the covers. Pages are white drawing paper. Visit MyHandboundBooks.Etsy.com to see Rhonda's other books.